Harold M. “Hack” Schoolman, MD, the former NLM Deputy Director for Research and Education, died August 17 at his home in Washington, DC after a heart attack. He was 85. Schoolman joined the NLM in 1970 and retired in 1999. He is credited with guiding the expansion of the National Network of Libraries of Medicine, which provides wide access to biomedical information, the acquisition and organization of non-print educational media, internal NLM research on information retrieval, and the Unified Medical Language System. Trained in internal medicine and hematology, Schoolman built a distinguished 32-year career in health administration, first at the Department of Veterans Affairs as Assistant to the Director for Medical Program Development and Evaluation, and later at the NLM. “He was an administrator nonpareil of the Library’s vast and varied research and education activities,” lauded NLM Director Donald A.B. Lindberg, MD. “He became the de facto expert on many thorny policy issues facing the NLM, including copyright as applied to health information, the licensing of NLM’s databases, and federal regulation of medical software,” noted current NLM Deputy Director Betsy L. Humphreys. Born in Chicago, Schoolman graduated from the University of Illinois at Urbana-Champaign and was a 1950 graduate of the University of Illinois medical school in Chicago. He served in the Navy V-12 officer training program during World War II and participated in combat in the Pacific. 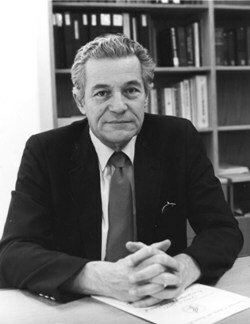 Early in his career, he researched leukemia and cardiac arrhythmias at Cook County Hospital in Chicago. From 1960 to 1967, he was the chief of the biostatistical research support center at the Illinois VA Hospital near Chicago and then settled in the Washington area to work for the Veterans Administration as director of education service. Schoolman was honored as “Alumnus of the Year for Service to the Government” from the University of Illinois, received numerous federal commendations, including the NLM and NIH Directors’ Awards and the Superior Service Honor Award from the Department of Health and Human Services, and was an elected member of the American College of Medical Informatics. Survivors include his wife of 50 years, Maria Josephy Schoolman of Washington, DC; two children, Anya Schoolman of Washington, DC and Philip A. Schoolman of New York; and three grandsons. September 1, 2009 in NLM Departments, People, Standards.